The Client is a pre Series A FinTech startup based in Singapore that provides a P2p remittance platform developed primarily for migrant workers in Singapore and Hong Kong. Its flagship app processes an average of $1 million in users’ money transfers to their home countries in Southeast Asia each month. The startup has so far raised $2.2 million in funding after three seed rounds. With more FinTech startups joining Southeast Asia’s growing P2P remittance market, players in this space are turning to more proactive customer acquisition strategies to sustain their growth momentum. Having secured $2.2 million in seed funding and handling more than $1 million in monthly remittance transactions, the Client seeks to expand the number of active users of its flagship app. Currently, the company’s online P2P money transfer platform caters mainly to migrant workers sending money to Southeast Asian countries such as the Philippines and Indonesia. The company maintains an in-house database of prospects collected through its list-building initiatives and opt-in campaigns. But as the list steadily grew, the company’s sales team has only been able to convert only a small percentage of the prospects into sales opportunities. The problem came down mainly to reps not being able to promptly follow up on enough leads, leaving a huge number of potential customers practically uncontacted. Plus, many of the prospects that got contacted turned out to be a poor fit with the company’s target customer profile. It was clear the Client needed more manpower to handle the tasks of initially contacting and screening prospects. Accordingly, the company decided to outsource much of these activities to a third-party provider and let their reps focus on the final steps in the conversion process. The Client chose Callbox because of the latter’s experience in B2C financial services and its track record of implementing integrated phone and email outreach campaigns which closely matched the company’s specific requirements. Callbox’s data research team checked and verified each record in the Client’s prospect list. The list was thoroughly scrubbed, then duplicate and incomplete records were appropriately processed. The first month’s list was exported into Callbox Pipeline, while the second month’s campaign exclusively used data in the Client’s own CRM. The team followed an outreach cadence that initiated contact with email touches and then engaged warm prospects through live phone conversations. These interactions achieved the two-fold objective of deepening awareness of the Client’s offer and qualifying potential leads for the company’s reps. The Client also gave Callbox access to its proprietary creditworthiness calculator to help the team identify which prospects qualified for their cash advance promo. 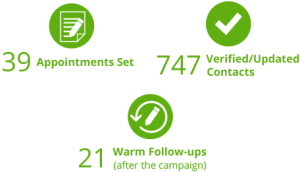 The campaign’s outreach cadence also included a sequence of additional email and phone touches to follow up and keep leads engaged. Appointments were confirmed via phone call to ensure leads show up for their meeting with the Client’s reps. The added touches also provided the Callbox team with more opportunities to gather crucial marketing intelligence about the prospects. The project has now wrapped up a total of two campaign months, with the first campaign completed in January of 2017 and the second in February last year. Based on the KPIs specified by the Client at the outset, the project has so far produced very good results: 201 booked appointments and 67 completed leads. The Callbox team was also able to profile 2,147 records from the Client’s in-house list and maintained response rates of 31% for phone calls and 17% for emails throughout the two campaigns. The Client continues to partner with Callbox, and the project is about to launch its third full campaign month. The Client is a Singapore-based financial advisory firm that specializes in tax, investment, pension, and estate planning for British expatriates living in SG. The Client offers several lines of financial planning services to expats currently working and residing in Singapore. The firm’s client portfolio primarily consists of UK expatriates, which has seen a steady year-over-year growth since its inception. The Client has also received a number of industry awards and recognition as one of Singapore’s leading and most trusted financial advisory groups. In 2016, the firm underwent administrative and operational streamlining. One area impacted by the changes was customer acquisition. The new business development strategy assigned prospecting and nurturing responsibilities into a single in-house team, which sometimes resulted in the same individual doing the tasks of researching prospects, screening contacts, booking introductory meetings, and following up on opportunities. The client wants its business development team to concentrate on bottom-of-funnel activities, so that they can devote more time and effort to crucial points in the conversion funnel. The firm plans to delegate most activities in its current prospecting process to a reputable third-party provider. 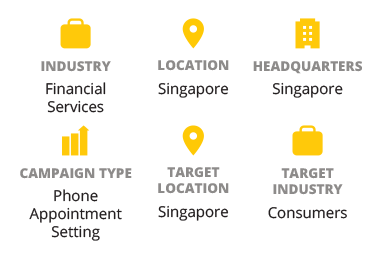 The Client chose Callbox after evaluating a number of options, citing Callbox’s extensive project portfolio of Singapore campaigns along with its flexibility to seamlessly integrate into the Client’s ongoing business development workflow. 1. The Client provided its own contact list to be used in the campaign, which was then thoroughly profiled by the Callbox team. 2. The Client’s list was cross-matched with records in Callbox’s in-house database as well as validated using external data sources. 3. Before being deployed, the list underwent a final round of data scrubbing where inaccurate, duplicate, and missing records were fixed. The updated list was handed over to the Client at the end of the campaign..
1. The Client also provided its own outreach email template, which was then reviewed by the Callbox team. 2. Callbox prepared the rest of the templates for the campaign, including copies for follow-ups, targeted send-outs, and triggered responses. 3. The Callbox team also designed and tested the various landing pages used in the campaign, as well as optimized each email component..
1. The Callbox team came up with a call script designed to achieve all three campaign objectives. 2. Agents qualified every prospect with probing questions that identified their suitability and willingness to schedule an initial phone appointment with one of the Client’s financial advisors. 3. The Client kept track of the campaign’s results in real-time through Pipeline, Callbox’s proprietary CRM and lead management tool. 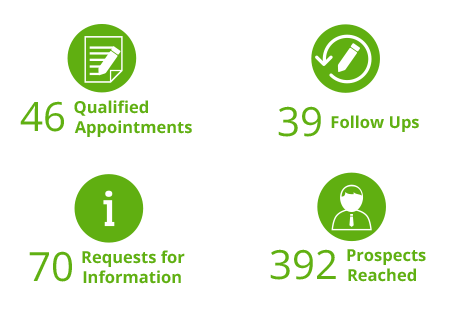 The campaign’s 46 qualified appointments began trickling in near the end of the first month (17 appointments) and increased in the second month (29 appointments), as warm contacts during the email outreach phase started converting into qualified prospects. While the Client hasn’t specified how much of the 46 phone appointments it expects to close as new customers, the Client says the quality of conversations with the Callbox-supplied opportunities has prompted an upward adjustment to its pipeline growth forecast. The accounting expert serves as an integral extension of its clients, ensuring all tasks are accurately completed. However recently, competition became fierce as competitors started to offer equally interesting services and even used enticing branding images which made the Client indistinguishable from its industry peers. The Client decided on offering a FREE-TRIAL to target customers. Well aware that this required expertise in pursuing prospects and getting them to agree to meet with the Client’s consultants to discuss signing up for the free trial, the Client searched for an appointment setting company that best fit their needs and chose Callbox. • Validated and updated contact details via Customer Profiling campaign. Callbox ran a Customer Profiling campaign along with Appointment Setting to update the Client’s database and to build a new set of qualified prospects. 1. An initial email copy which contained news releases about the Client’s FREE TRIAL offer were sent to target customers. option) in the email copies. 4. Bounces were filtered and saved for follow-up calls for the agents to update as they speak with the prospect. Aside from targeting to gain a new set of clients, the Appointment Setting program aimed to exhibit a differentiated service by giving their customers a first-hand experience of the service. 1. With the help of the Pipeline Lead Nurture Tool, the team was able to profile the contacts in the database: information like contact name, address, contact numbers and email address were updated. 2. Initial email copies with replies were set for follow-up call – appointments were set for prospects who agreed not only to the FREE TRIAL but also for those who were merely interested to discuss about the Client’s services. 3. To ensure that appointments were not missed, the Callbox team sent calendar invites to prospects to remind them of their appointment schedule. 4. And with Callbox’s SMART Calling system, a hefty number of prospects was reached by the Callbox team to speak with the Client’s specialists and agreed to a FREE TRIAL. The first four weeks were the busiest days of the campaign period as the Callbox team was juggling between getting together a fitting list of contacts to profile and setting appointments with those contacts at the same time, but successfully delivered 11 solid appointments. Between the 5th and 8th weeks, with the Callbox team effectively done with the initial calls, follow-up calls came out more productive as most of the prospects the team spoke with were already knowledgeable of the free trial and have learned of the service’s benefits from other prospects via testimonial videos linked through the follow-up emails. This phase of the campaign generated 13 more appointments for the accounting expert. The last 4 weeks (9th to 12th) had the Callbox team equally busy but more delighted as follow-ups that were nurtured during the start of the campaign eventually converted into appointments and impressed the Client with 15 appointments at the closing. https://www.callbox.com.sg/wp-content/uploads/2019/02/CS_FIN_Demand-Generation-Callbox-Takes-Business-Loans-Marketing-Laid-Back-Look-Out-Were-Back.jpg 450 800 Jayden https://www.callbox.com.sg/wp-content/uploads/2019/01/callbox-logo.png Jayden2016-07-29 06:10:262019-04-04 10:55:04Demand Generation: Callbox Takes Business Loans Marketing from "Laid back" to "Look out! We’re back!" The Client is a leading media company in Hong Kong, providing news and finance information services to financial intermediaries and high net worth individuals. The services they provide include educating Chinese financial intermediaries on the effective use of tax planning and asset management through series of summit. They work on a platform that was built from different media channels like online media, periodicals and guides to deliver the latest information and relevant topics to finance professionals. Basically, the Client’s job is to bridge a connection between Chinese financial consultants and companies planning to bring their businesses offshore via financial conferences. These businesses could either be companies from neighboring countries in Asia like Singapore that would want to be educated on how to bring investments to Hong Kong, or Hong Kong-based companies that would like to expand their businesses to other regions. The Client prides itself in being recognized as the leading media company in Hong Kong that is able to get every financial summit they launch jampacked with attendees. The leads generated from such impressive attendance numbers, however, are a different story. Since its inception in 2010, the Client’s events have had subpar lead turnout at only 10-20% warm follow-ups and those interested to discuss further out of the total number of attendees. Others were just curious to hear what the meeting was all about and didn’t really have the need for offshoring. At that point, the Client realized that they needed a more targeted audience who have the need for education on offshoring and equally interested to engage further with their services. There was added pressure to expedite the project since a series of summits were already on the approving stage and were ready to take off anytime once scheduled were finalized.. 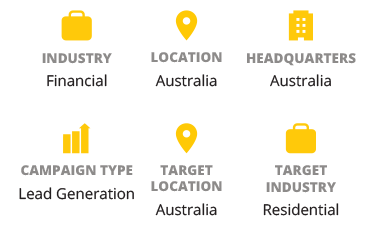 The challenge was, the Client didn’t have the proper tools and processes to use to address their need – to profile their target attendees and gauge the need to be educated, and uncover the genuine interest for offshoring opportunities. Callbox designed a multi-channel marketing campaign with the help of the Callbox Pipeline Lead Nurture Tool that fully addressed the Client’s needs. The following activities were simultaneously ran throughout the campaign duration – exerted with best effort by both Callbox and the Client. Callbox’s filtered database together with the Client’s existing one were profiled by the team. Aside from updating the contact details like name, business address, phone numbers and emails, the lists were well-managed by scrubbing off DNs and revalidating bounced emails off from both lists. Also, to enhance customer experience, the agent walked the prospects through the Client’s website to assist them with any concern like queries about the services, browsing through the summit schedules or signing up for the upcoming events. Both the Callbox team and the Client regularly convened to discuss the successes and challenges encountered in the campaign. This was the venue where specific action plans were laid down to be understood by everyone in the team and carefully structured to address challenges and even avoid repetition of the course. Aside from the regular meetings, Callbox utilized the integrated features of the Callbox Pipeline, particularly its Lead Nurture Tool to send real time updates to the Client such as appointment schedules and confirmation emails. The multi-channel marketing campaign concluded with stellar results.The Callbox team delivered 19 confirmed appointments which scored 30% turnout from the total number of attendees. These were prospects who were profiled and identified to have both the interest on offshoring and the need to be educated . In addition to the the appointments, 38 warm follow-ups were prospects for confirmation of attendance whether they or their representatives will attend and there were 48 who requested for more information – these were prospects who, with thorough probing, were identified to have the need for education and interested in offshoring opportunities but decisions were held pending due to some matters for further discussion. The leading media company was perfectly happy with the campaign turnout. With Callbox’s multi-channel marketing campaign, the Client’s list of customers were properly profiled and filtered according to need and interest in the Client’s services. The summit that included the 19 confirmed attendees produced a number of leads that were converted into current customers and are successful investors in their chosen region. 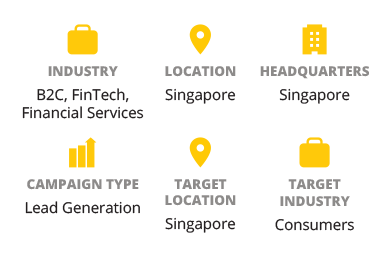 The Client, based in Singapore, is the largest privately-managed insurance broker in the world with offices in Hong Kong, Beijing, Malaysia, the Philippines, Thailand, and South Korea. The Client has an in-house team in Hong Kong which supports its marketing activities in Asia, seeking decision makers of S$20M companies. In order to increase the volume and value of sales, the Client needed to build an intelligent prospecting campaign focused on sales-ready prospects. Since it lacked commercially available data to support this activity, the Client partnered with Callbox to segment its market and create a database of targeted prospects. However, after speaking with a Callbox sales rep, the Client was impressed with the company’s telemarketing capability so it signed up for a three-month Appointment Setting and Database Profiling campaigns. To build a well profiled database of the Client’s prospects in Singapore. To market the Client’s Corporate Risk and Employee Benefit insurance programs. Callbox set up a telemarketing team for a two-phase campaign: Database Profiling and Appointment Setting. The Client personally selected and trained the agents assigned to the calling campaign and the target decision makers were identified: HR and Finance Managers. Callbox telephoned contacts in the Client’s database to identify companies in Singapore whose indemnity insurance was up for renewal. For Employee Benefit Insurance: prospects must have between 20 and 50 full-time employees. For Corporate Risk Insurance: prospect companies must have a minimum annual revenue of S$20 million. 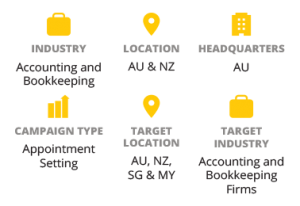 As the campaign progressed, the Client narrowed down the lead qualification criteria in order to capture larger prospects with near-term requirements. The target size for Corporate Benefit was changed from 50 to 100 full-time employees and for Corporate Risk Insurance, from S$20 million to S$50 million companies. The Client also required that proximity of renewal dates should not be longer than three months from the time of call. Prospects whose renewal dates were longer than three months were profiled and entered into the Client’s database for tracking and future follow-ups. One challenge encountered during this campaign was frequent cancellation of meetings because the Client did not have enough sales reps to accommodate the growing number of new appointments. To remedy the situation, Callbox prepared weekly schedules of appointments for the Client to review and approve. The Client worked closely with Callbox to provide feedback and updates. 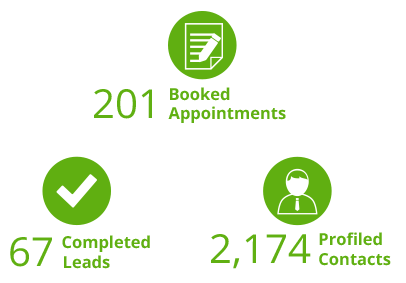 One month into the campaign, Callbox delivered a total of 19 qualified leads and 897 profiled records with one Callbox agent achieving a contact rate of 30%. 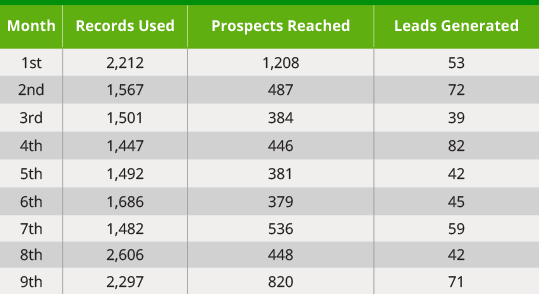 Surprised with so many leads after just one month, the Client decided to hire two more agents but to restrict the lead qualification even further, going after only the most promising prospects. This generated a total of 26 highly qualified leads and 1,698 profiled records. Pleased with these results, the Client renewed its contract and expanded its campaign to five seats for six months. By the end of the third month, Callbox was able to profile 12,749 records and deliver 186 highly qualified sales leads. The campaign is currently in progress and the Client plans to use Callbox’s services for other long-term projects. The Client is an independent property tax consulting firm specializing exclusively in providing taxpayers of commercial, industrial, multi-residential, and special purpose properties with full-range property assessment and tax management services. They have a national reach with 19 offices that handle large sales territories across the United States including New York, California, Illinois, Pennsylvania, Massachusetts and Texas. The Client needed a way to help all their Managing Consultants who head each regional office across the country in bulking up their sales pipeline. The Client approached Callbox to conduct an aggressive telemarketing campaign that would fill their calendars with qualified appointments on a daily basis. Starting with a test campaign for one location in November of 2005, Callbox now conducts the appointment setting campaign for 14 of the Client’s 19 locations including its head office in Arizona. Callbox appointment setters then e-mail the prospect companies copies of the Client’s marketing collateral and Statement of Qualifications. Appointments are then delivered via PipelineCRM, an online CRM tool developed by Callbox especially for clients with distributed offices and disparate territories. This enables consultants and specialists to access their up-to-date sales pipeline anytime, anywhere, maximizing their time to develop new business. Sales people can follow-up the appointments even when the Specialists are not available, making sure no leads fall through the cracks. Callbox experienced appointment setters coupled with the Callbox online appointment setting tool allowed the Client to concentrate on their core business-delivering exceptional property tax consulting services rather than cold-calling and managing each sales person. Coherent single-source feedback on the current pulse of the market in various territories.